Bishop Gorman senior Dorian Thompson-Robinson has the unenviable task of trying to fill the big shoes of 2016-17 national Gatorade Player of the Year Tate Martell, who has moved on to Ohio State after quarterbacking the Gaels to three straight national championships. But all the UCLA-bound Thompson-Robinson did in his first start under center was throw for three touchdowns and run for two more to help rally fourth-ranked Gorman to a 35-23 victory over No. 6 ranked DeMatha of Hyattsville, Md., on Friday at Fertitta Field. Thompson-Robinson, who survived almost throwing a pick-six on his second pass of the game when Stags corner and Pitt commit Judson Tallandier jumped an out route and couldn’t hang on, completed 19-of-23 passes for 288 yards. He also scored Gorman’s first two touchdowns on runs of two and one yards, the latter which gave the Gaels their first lead, 13-10, with 9:48 left in the second quarter. DeMatha regained the lead on a 12-yard touchdown pass from Ty Lenhart to junior wide receiver DeMarcco Hellams on the first series of the second half. But the Gaels answered with 22 straight points thanks to Thompson-Robinson touchdown passes of six yards to tight end Falcon Kaumatule, 68 yards to wide receiver Jalen Nailor and 22 yards to wide receiver Jimmy Telles to make it 35-17 with 4:27 remaining. 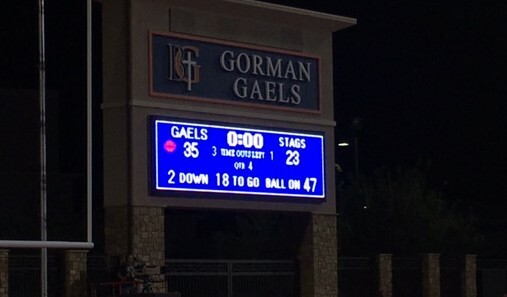 The victory extended Bishop Gorman’s win streak to 55 games, including 31-0 under third year head coach Kenny Sanchez. Thompson-Robinson, who displayed Division I ability at wide receiver the last two seasons while patiently waiting his turn at QB behind Martell, admitted he experienced a few nerves heading into the contest. Next up for the Gaels is a trip to Santa Ana, Calif., and a date with the nation’s No. 1 ranked team, Mater Dei, on Friday night. The Monarchs, led by 2019 USC quarterback commit J.T. Daniels, opened their season with an impressive 31-7 win over Bishop Amat on Friday.